With several acting awards under her belt and having headlined the first female-led superhero film to make $1 billion worldwide, it’s safe to say that Brie Larson is having one hell of a career boost right now. So, what better time to debut her first directorial effort Unicorn Store, in which she also stars alongside her Captain Marvel co-star Samuel L. Jackson, when she has the world right in the palm of her hand? Thanks to Netflix, Larson’s first film as a director is now available to watch the world over, and she has picked a very unusual but pretty decent movie to begin her new career path with. Larson is Kit, an aspiring artist who’s recently been kicked out of art school after failing to impress her professors, and is forced to move back in with her guidance counsellor parents (Bradley Whitford and Joan Cusack). 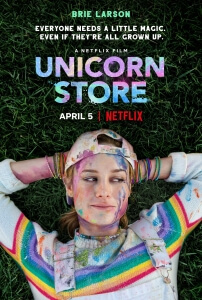 She gives adult-ing a try by landing a temp job at a vacuuming firm, but one day she receives a letter inviting her to a place known only as The Store; there, she meets The Salesman (Jackson), who tells Kit that he sells the one thing that she has always wanted, ever since she was a child – a real, living unicorn. However, before she can acquire her lifelong dream pet, Kit must prove to The Salesman that she is worthy of owning a unicorn, which leads to her recruiting local handyman Virgil (Mamoudou Athie) to help her build a stable, get enough hay to feed it, and place it in a safe, loving environment. As she attempts all of those things, Kit begins to feel the responsibilities of adulthood overshadow her childish dreams. With a plot like this, and in the hands of someone perhaps a little less self-aware, it’s easy for it to go very wrong, very fast; the film is written by Samantha McIntyre, whose previous credits were for a couple of shorts and some TV episodes with this being her feature writing debut (she also has a small role in the film), and the way her story plays out it feels like if the stereotypical Manic Pixie Dream Girl downloaded a version of Final Draft and wrote this while binging on My Little Pony: Friendship Is Magic. There are times in the story where it starts to feel like the lead character might genuinely need some psychological help, as sometimes she’s written to be so kooky and to sound so crazy when describing her upcoming magical purchase that it can stop being delightfully quirky and start to get a little scary. This being a PG, though, it’s clearly designed for a slightly younger audience, so any real conversation about mental health in this film, if any at all, is very lightly touched upon, with the overall vibe being a family-ish film about something that, when seen from a certain distance, sounds rather aloof and strange. The point being, if a script like this fell into the hands of someone who didn’t also recognise those elements, then the film would have turned out a lot more misguided than it is; but luckily, Larson is more than game to take on the material, and makes it seem sweet and playful while also bringing up some of the harsh facts of life that fit in decently enough to all the fantastical stuff going on around it. There are themes of self-doubt in the film, especially in young adults who suddenly return home from higher education and find they have little to no direction in life – being in that exact same position, I connected to that a little too much – and even themes of sexual harassment, with Kit’s boss Gary (Hamish Linklater) clearly sending out red flags whenever he’s around his new temp, to a point to where his female assistant (Annaleigh Ashford) comes at her in a fit of jealousy, showing first-hand how ongoing and predatory this guy is. As a director, Larson gets these themes across just fine, and as an actress she does so even more, but those plot strands tend to come and go whenever they please; again, this all comes back around to the fact that this script is kind of all over the place. Tonally, it struggles to pick a side and stick with it, as it can be bright and bubbly one minute and then the next it will be getting into some of its heavier themes, and there’s only so much whimsy that can disguise a more serious moment when it really just needs to play out on its own terms. None of this is Larson’s fault, she’s just working with the material; but seeing how problematic this script kind of is at times, we should be grateful that Larson at least tried to make it come across less crazy than it could have been. Her direction here is perfectly fine, and she is a great actress who can make just about anything work, but in the end it all comes down to the script, and despite her efforts Larson can’t entirely make it seem as natural and genuinely heart-warming as it was maybe intending to be. It feels overwhelmingly quirky, which I feel can put some people off with all its sugary-sweetness and whimsical fantasy, but the acting is very good in this film and the direction is serviceable enough that it’s not as painful as it could have been. What I fear most, however, is all of those online trolls who tried to down-vote Captain Marvel on social media will take the fact that this movie is just mediocre and try to convince everyone that it’s the worst thing since the women got the vote. Those people can wither and die, for all I care, but it doesn’t change the fact that, at the end of the day, Unicorn Store isn’t even worth getting all that mad about. Unicorn Store is a well-meaning but overly cutesy and quirky little movie that, despite star and debuting director Brie Larson’s best efforts can’t entirely make its aloof and tonally inconsistent story completely work.